CLICK HERE TO BUY THIS BOOK NOW!! essential biblical principles of entrepreneurial leadership. The book includes study questions at the end of each chapter. Further, and this is rare, the book is supplemented by online access to numerous interview transcripts and video profiles of highly-successful entrepreneurs. Be inspired to find your calling and to make a difference in the marketplace, church and beyond." "Anyone who wants to be his/her own boss -- to pursue opportunity and risk responsibility -- should think about God as entrepreneur. Goossen and Stevens bring an entrepreneurial God into dialog with the successful leaders of their research to enrich and enlarge our understanding of what it means to be an entrepreneurial leader and a follower of Jesus, in the workplace, the church and the world. This book will make you think about who you are, why you do what you do, and how you do it." "Rick Goossen and Paul Stevens have drawn upon many years of experience, reflection and research to craft a thoughtful and truly unique volume. 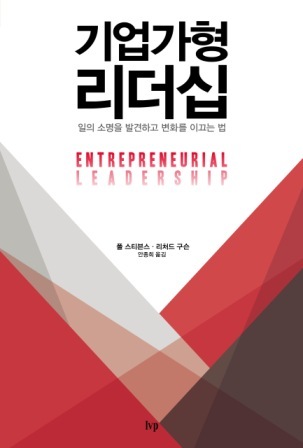 This book should be widely read as it is brimming with theological and practical insights that apply to entrepreneurial leadership as it is practiced in many settings." Kenman Wong, Professor, Seattle Pacific University, Seattle, WA & Co-Author, Business for the Common Good: A Christian Vision for the Marketplace. Theodore Roosevelt Malloch, Research Professor, Yale University, New Haven, CT and author of Doing Virtuous Business. 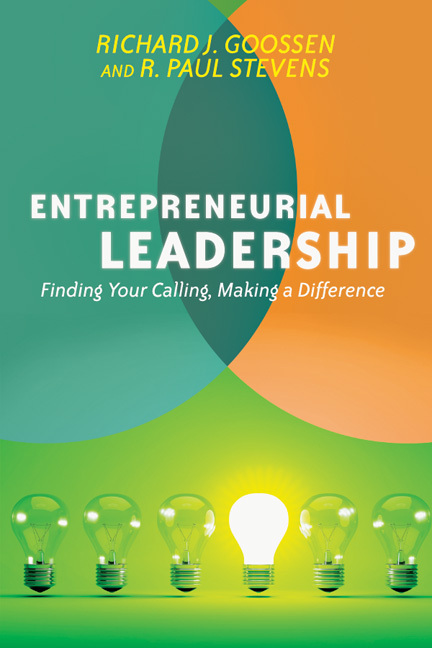 "This book shows us that we can accept the challenge to lead by example within the creative and entrepreneurial character gifted to all of us by our creator. This is the guide to a real, working model for leadership and entrepreneurship; showing us that the key to the invigoration of our whole person and calling is found in Christ." 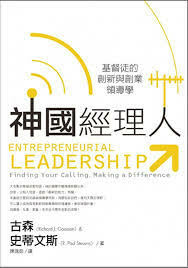 "Entrepreneurial Leadership provides a fresh biblical perspective on the concept of entrepreneurship. It is cognitive, critiquing humanistic understandings, reflective and practical. The sober approach to the subject especially in relation to wealth creation and loving your neighbour through work is much needed in the African Christian context which tends to gravitate towards the health and wealth extremes." Jimmy Pak, Founder and Managing Director of Net-Makers Limited, Hong Kong & Coordinator of Toys Christian Fellowship Hong Kong. Cheong Seng Gee, Executive Director, P.O.D. Advisory, Kuala Lumpur, Malaysia. "In this book, Dr. Stevens and Dr. Goossen vividly demonstrate how we can effectively integrate business and entrepreneurship up to our faith. I am from the Philippines, the only Christian nation in Southeast Asia where more than 90% of its citizens are professing Christians and majority of businesses are owned by small and medium entrepreneurs, this book has profound implications not only to the individual but to the nation as well. If every Christian will operate his or her business in accordance to Biblical principles then he or she can be a credible witness for Christ and make a difference in this world."